As a human person, I have two modes. Some days, I am up with the sun to fit in a quick jog before powering through my workload so I can fit in some volunteering and light reading of the Russian classics before turning in early. And don’t even get me started on how great my hair looks. But other days, I’m more of a … human dumpster fire, waking up just before work, rolling into whatever is on my floor and ceding the Great Cowlick Battle of Every Day This Week. It’s okay, though. You can’t always be great at everything. Well, to be fair, Lamarr also had two levels of person-ing. (Stars – they’re just like you!) They just both happened to be spectacular. She was once called the “Most Beautiful Woman in Films.” The Austrian actress appeared in all her Hedyness – and not much else – in a 1933 Czech film called Ecstasy, the first movie to feature a close-up of a woman, uh, in great pleasure. Even fully clothed, she was an Old Hollywood beauty who starred opposite Clark Gable, William Powell and Spencer Tracy, among others. But being looked at wasn’t really Lamarr’s greatest goal. She once said, “Any girl can be glamorous. All you have to do is stand still and look stupid.” In lieu of standing still and looking stupid, Lamarr decided to try something a little different. Enter Hedy Lamarr Level 2, wherein she oh so casually invented the early phases of wireless internet. Lamarr’s first husband was an arms dealer, who was, by some accounts, the third richest man in Austria at the time. (P.S. he maybe made some of that fortune selling weapons to the Nazis.) According to Lamarr’s memoir, he was abusive and controlling and did not like his wife appearing in movies. Before she dressed up like the maid, jumped out the window and ran away from the marriage with all of the jewelry he’d given her, Lamarr spent a few years at his table, listening to military leaders and arms dealers talk shop. It was there that she began to develop an interest in inventing. During World War II, with the rise of radio-controlled submarines and torpedos, Lamarr began to tinker with frequency-hopping signals that couldn’t be jammed by 1940s hackers. She and her inventing partner, composer George Antheil, invented a signal that couldn’t be intercepted. This could have been an essential tool in defeating the Nazi forces. But the U.S. military said they weren’t interested and told Lamarr to, essentially, stand still and look stupid. Instead of cranking out more genius inventions that could save our troops on the front lines, they said, why don’t you let us auction off your body? They asked her to run a fundraiser in which she would kiss anyone who bought $25,000 in war bonds. And, to be fair, $7 million in war bonds were sold that night. But years later, during the Cuban Missile Crisis, the Navy got their heads out of the sand and “discovered” the genius in Lamarr’s invention. They installed the frequency scramblers on war ships and torpedoes. The impact of Lamarr’s invention was far greater than just the military. Frequency-hopping “spread spectrum” signals are the technical infrastructure that allows the digital communication industry to exist at all. If you’ve ever used a cell phone, a fax machine, a Bluetooth device or WiFi, you’ve got Lamarr to thank. Lamarr never earned a dime off of her invention. She donated the patent to the Navy as part of the wartime effort. 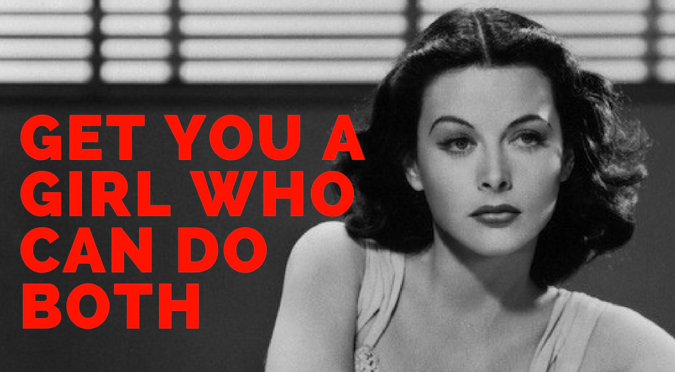 However, take it from someone wearing the same shirt two days in a row: until you’ve been billed as the most beautiful woman in film, invented the internet and mastered the cow lick, on behalf of the estate of the late, great Hedy Lamarr, I’d like to kindly ask you to shut up. Previous Squad Goals: Can A Girl Get a Monument?